Nick Clegg sets out four conditional "tests" for Liberal Democrat support of a minority government. They are not as progressive as they look at first sight. Nick Clegg today sets out the four “tests” that would be conditions for the Liberal Democrats supporting a minority government in the event of a hung parliament. The list was previously trailed as a “shopping list” of demands. But whatever the branding, and while there is much to support, at least two of the four goals are not as progressive as they look at first sight. Left Foot Forward examines each in turn. The Lib Dems’ flagship policy is to raise the threshold at which people start paying income tax from current levels to £10,000. They claim this would “cut the average working age person’s income tax bill by £700”. The idea has proved popular with Labour supporters topping Labour List’s poll of “New Ideas” and has even been called “the most attractive policy in British politics” on the Spectator’s Coffee House blog. But as Vince Cable has admitted to this blog, “[the policy’s] redistributive effects may be not quite as radical as you get with tax credits.” Left Foot Forward will be publishing more analysis of the regressive nature of the policy in the coming days. 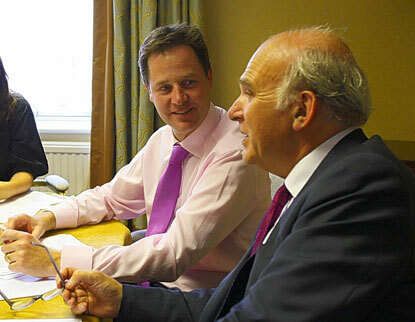 On the other hand, the second aspect of the Lib Dems’ tax reform is more progressive. They propose taxing capital gains at the same rate as income. The Compass report, ‘In place of cuts‘ sets that it was Labour which initially removed the link with a new capital gains tax rate of 10 per cent in 1997. The time to reverse this tax policy and remove a significant incentive to the tax avoidance industry has arrived. The Lib Dems’ controversial “Mansion Tax” has been attacked as “unworkable“. And while it would certainly generate income from wealthier tax payers, it is not as progressive as either the original proposal to tax all properties worth over £1 million, from which the leadership backtracked, nor the Compass proposal to “increase Council Tax multipliers above Band D to raise the yield from Council Tax on expensive houses”. And although it does not appear to a formal part of the four “tests”, progressives should also be concerned by Nick Clegg’s pandering interview to the Spectator where he pledged to outflank the Conservatives by bringing down the deficit “purely [with] spending cuts”. The Liberal Democrat’s Education policy briefing outlines that they want to “spend an extra £2.5bn on schools, guaranteeing them the money they need to support children who are struggling.” The policy sounds progressive and is certainly a step in the right direction. Indeed, the UK already has some deprivation funding in place. For example in 2009-10, per pupil funding for the City of London, where large numbers of pupils come from poorer backgrounds, was £7,603 compared to a national average of £4,218( xls). In 2008-09, 12.1 per cent of overall per pupil funding was allocated for pupils eligible for free school meals and those with additional educational needs. But as reported in the Financial Times, the Institute for Fiscal Studies has said that pupil premium was “unlikely to reduce social segregation” or generate the same number of new schools in poor areas. It said it would also “reduce the attainment gap” between poor pupils and other children only “to a modest degree”. Meanwhile, American academics have estimated that in order to overcome the disadvantage linked to race in the US solely by using education funding as the equalising mechanism, you would need to spend 9 times more per capita on black students than white students. Meanwhile, evidence from Brazil suggests that by combining disadvantage funding with other inputs – such as peer group quality and school effectiveness – you can cut by half the amount needed for the pupil premium. In other words, overcoming inequalities in outcomes requires both skewed funding and other reforms. The aims of the Liberal Democrats’ industrial policy is clearly progressive and the country would benefit from a more balanced economy. But there are other sectors that would also benefit from greater government support. According to the ippr’s report ‘Building a better balanced UK economy‘ the “new areas for employment growth” include knowledge industries, high-tech manufacturing, the creative industries, pharmaceuticals, and care services. The Liberal Democrats style themselves as “the only party who have always been committed to fixing our broken politics.” Unlike Labour and particularly the Conservatives, the Lib Dems’ consistent support of constitutional reform makes their case all the stronger. Their platform includes policies that have long been called for by a range of progressive organisations including a fully written constitution, electoral reform, and votes at 16. In addition, they have a range of sensible reforms such as spending limits on political parties outside elections and giving Parliament the outdated Royal Prerogative powers. More controversial among their proposals are plans for the Houses of Commons and Lords to be constituted using the same electoral system. While reforms to the electoral systems for both Houses are long overdue, using the same system could undermine the legitimacy of the Commons. You see, the problem is that ‘building a more balanced economy’ might sound like a good idea; however, where is the money coming from if Clegg is going to reduce the deficit with 100% spending cuts. No doubt this is why the ‘Green Road out of Recession’ never gets mentioned anymore…. Isn’t one of the problems with tax credits though that not everybody who is entitled to them claims them? Raising the income tax starting point like this would make sure everyone was covered.